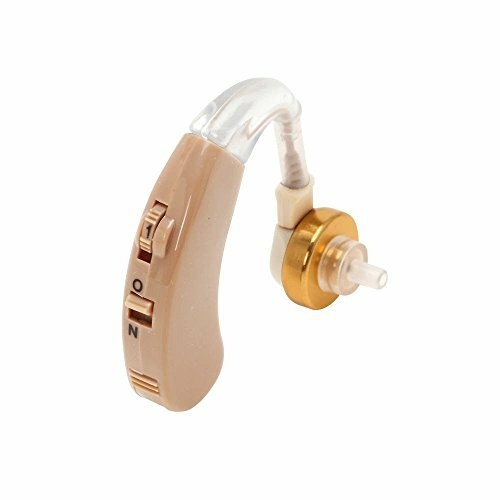 The SOUNDaid Personal Sound Amplifier by MEDsheer is a discreet, lightweight and economical behind-the-ear hearing amplifier that brings a clear, natural sound to your ears without the high cost of some medically prescribed devices. COST EFFCIENT - incorporating technology used in hearing instruments tend to cost hundreds or even thousands of dollars. SOUNDaid hearing amplifier enhances the sounds you want to hear. DISCRETE - SOUNDaid fits comfortably behind either ear. There are no embarrassing wires, headphones, or handheld amplifiers. Use this device while watching television at home or a film at the theater, attending work meetings or classroom lectures, listening to music or podcasts, social gatherings, increasing the sounds of nature and wildlife, or virtually any other situation where you may have difficulty hearing. TOTAL PACKAGE - Unlike other sound amplifier packages, our SOUNDaid offer gives you everything you need to start hearing better as soon as possible! - Improves the quality of sound around you. - 3 different sized silicone ear plugs that comfortably fit most ears. - 4 adjustable volume settings. - Anti-shock, anti-drop, moisture-proof, and high temperature-proof. - Lightweight and easy to wear. - Low noise, distortion, and feedback. 100% GUARANTEED SATISFACTION for our SOUNDaid customers is our Goal! ORDER TODAY!!! If you have any questions about this product by MEDsheer, contact us by completing and submitting the form below. If you are looking for a specif part number, please include it with your message. Rechargeable NewEar High Quality Digital Ear Hearing Amplifier FDA Approved NEW Model!